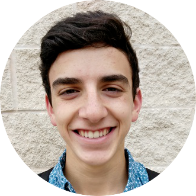 Hey my name is Zach Bernstein, and I am a junior at Yavneh Academy of Dallas. I love math, and I have loved it for my entire life. This year I even decided to take two math classes, which leaves me with no free periods, but it’s okay because I get to do more math! I find math so fun especially when I’m learning a new concept and it clicks; it is one of the best feelings. I also love how math is so applicable in the real world, and it explains so many things in my everyday life. With the world becoming more and more technology based, math is becoming increasingly (you might even say EXPONENTIALLY) more important. Thankfully, many people at my school, such as my great friend, Leib Malina, share the passion that I have for math, and as a result the Jewish High School Math League was created.